Our Mission: To stop the epidemic and related health inequities by eliminating new infections, maximizing healthier outcomes for those infected and at risk, and tackling the root causes of HIV/AIDS. In the June 5 Morbidity and Mortality Weekly Report, CDC reports a rare form of pneumonia in five gay men, which are later determined to be the first published cases of AIDS. CDC introduces the term Acquired Immune Deficiency Syndrome, or AIDS, as a replacement for Gay-Related Immune Deficiency (GRID). The AIDS Action Committee is founded – initially as a committee of the Fenway Community Health Center – to respond to the epidemic. AIDS Action remains the largest AIDS service organization in New England. With the isolation of HIV, the U.S. Department of Health and Human Services predicts an HIV vaccine will be available by 1990. This prediction proves to be overoptimistic. Ryan White, an Indiana teenager with AIDS, is barred from school, a case of stigma and discrimination that gains international media attention. The U.S. Surgeon General publishes his first report on AIDS, the government’s first major statement on what the nation should do to prevent the spread of HIV. The AIDS Memorial Quilt is displayed on the National Mall in Washington, DC, for the first time. AIDS Action and its volunteers establish the HIV Treatment Education Library (now known as AIDS Action’s Health Library). Activists, clinicians, and consumers work together to form Community Research Initiative of New England (CRI). CRI becomes and remains a major national HIV research organization. Governor William Weld signs into law legislation allowing 10 pilot needle exchange programs to be established in Massachusetts. AIDS Action works to get an AIDS education curriculum and condoms into schools in Boston and 28 other school districts. 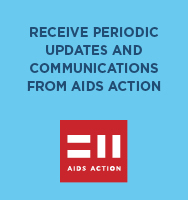 Because the new HIV regimens involve many doses and pills each day, AIDS Action launches an adherence program to help people keep up with their HIV medication regimens. Number of AIDS deaths continues to fall, but reports of HIV combination treatment effects and adherence problems are on the rise. Youth on Fire, a drop-in center for homeless and street-involved youth ages 14 to 24, opens in Harvard Square, Cambridge. OraQuick Rapid HIV test is approved, allowing HIV antibody testing in as little as 20 minutes using blood from a finger prick. TransCEND (Transgender Care and Education Needs Diversity) opens in Cambridge. The 35th anniversary of the CDC’s first reported case of what would come to be known as HIV/AIDS. U.S. Congress reauthorizes PEPFAR for five years, while also voting to end the HIV travel and immigration ban. UNAIDS establishes “90-90-90” HIV treatment targets to be achieved by 2020: to diagnose HIV in 90% of all people infected; to provide sustained HIV treatment to 90% of all people with diagnosed HIV; and to achieve viral suppression in 90% of all people receiving HIV treatment.